Scosche already announced a nifty wireless charging in-car mount, the MagicMount Charge3, at CES yesterday, but the new MagicGrip Charge is pretty interesting as well. This Qi-powered mount actually grabs your phone from you with motorized arms — something I’ve never seen on a car mount before. Whereas the MagicMount Charge3 requires magnets to securely hold a phone, the MagicGrip Charge uses motorized arms instead. When the charger detects a Qi-equipped phone is aligned over the charging coil, the arms will automatically close. The phone can be oriented in portrait or landscape thanks to a 360-degree charging head, and a “thermal management channel” is created between the phone and the charger to allow for cooler charging. An LED ring will illuminate in blue when charging, but it’ll flash red when it detects a non-Qi device. 10W fast charging is supported, though no Google certification for the Pixel 3 is mentioned. The MagicGrip Charge is available with a dash mount, a window/dash mount, a “Double Pivot” mount for tight spaces in the car, and the same patent pending vent mount that allows airflow to be uninterrupted that we saw on the MagicMount Charge3. There’s no word on pricing, and Scosche merely says that the mount will be available this fall. Check out SCOSCHE® Industries during CES in the Las Vegas Convention Center, South Hall 3, Booth #31106 for a demonstration of the new MagicGrip Charge Wireless Charging Mount, as well as an exciting new array of consumer technology, powersports, and car audio solutions. 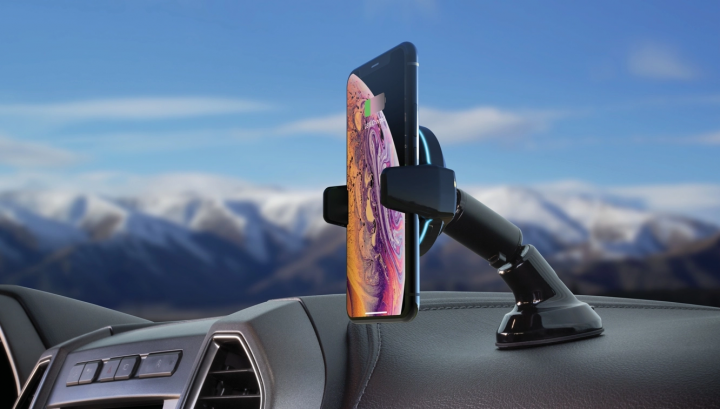 LAS VEGAS – (Jan. 10, 2019) – SCOSCHE® Industries (pronounced skosh/skohsh), innovators of award-winning consumer technology, powersports and car audio products and accessories is pleased to reveal its unique new wireless charging mount, the MagicGrip* Charge. The MagicGrip senses when a Qi-enabled device is perfectly aligned over its charging coil and that alignment signals the motorized arms to automatically close, securely hold and wirelessly charge the device as you drive. This sensing closure ensures perfect placement for optimum charging and full device visibility. The charging head of the MagicGrip provides a full 360-degree rotation, allowing users to view the device in landscape, portrait, or any angle in between. With the phone held in place by the arms, it is free of any cables and impediments and can be turned with a light, but distinct dial-like feel. Another significant benefit of the MagicGrip is that while the device is held in place by the motorized arms, a thermal management channel is created between the phone and the Qi-charging head. This channel allows heated air to disperse and be replaced by cooler air during charging. Cooler charging is safer for the life of the device’s battery, as well as the device itself. Qi-certified by the Wireless Power Consortium (WCP), the MagicGrip delivers up to 10W of charging power, supporting Apple and Samsung Fast Charge. Foreign Object Detection is built-in to protect the device by preventing charging if something other than a Qi-enabled device is placed on the charging head. An ambient light sensing LED light ring illuminates soft blue during normal charging but flashes red to indicate foreign object detection. The MagicGrip Dash Mount uses Scosche StickGrip material to provide a strong hold to a dash, table or other flat surface. The 360-degree pivoting base allows multiple angle options and adjusts to hold firmly once you’ve achieved the desired angle. The MagicGrip Vent mount is quick and easy to install, remove, and transfer from vehicle to vehicle. A patent pending open design allows unimpeded airflow from your vehicle’s HVAC vent, and an articulating swing arm lets you position your device away from the vent. The MagicGrip Window/Dash’s StickGrip base allows you mount it on any flat surface at home, in the office, or in-vehicle. The MagicGrip™ Double Pivot option can be mounted in various places in your vehicle, including tight spaces. With a StickGrip suction-cup base and double-pivoted base that offers multiple adjustments and viewing options. The MagicGrip Charge Wireless Charging Mount will be available Fall 2019.